First let me say that I agree; the Moffat/Gatiss reboot is masterfully done with the zeal and dare I say love of true fans, which they freely admit and clearly are. The pair take great pains to carefully weave essential Holmesian lore where appropriate and expound and argument, like historical homes renovators [sic], with equal care and fan-dom love. That said, I think you take the producers’ nods to “high functioning” psychological pathology past what they are; touchstones of 21st century TV psychology and, I think, it is impossible to rate Conan Doyle’s turn of the century narrative with the “Sherlock” modern retelling, and in that I think you’ve completely missed the difference. Any reading of the original works, and they main unshakeable, undeniable reason for Jeremy Brett being THE quintessential Sherlock (with all due respect to Basil Rathbone for keeping Holmes for us and Nigel Bruce for making Watson essential). That Benedict Cumberbatch brings some essential of the Victorian prototype is due to his excellence as an actor. That Martin Freeman has the latitude to make his Watson almost what’ve he wants is more on point with Conan Doyle and his successors’ telling and retelling of the Holmesian narrative and most story tellers complete inability to know just what to do with Dr John (again thank you to the Nigel Bruce’s loyal and love able Watson for firmly and fully galvanizing Watson’s legacy). You can not compare the Conan Doyle and Moffat/Gatiss versions. While it is cleaver and masterful how they translate Watson’s first realization at Holmes’ prowess (e.gl pocket watch vs cell phone) that they could identify the modern equivalent with its Victorian ancestor is brilliant, but let’s face it: a pocket watch is a time dice and a cell phone is a computer in your pocket. No Victorian Englishman, nor his Edwardian heir, could or would ever discuss or even allude to his feelings or family issues or personal “sorted” habits as it would be highly “inappropriate”. In fact, Victorian Holmes is poking holes in Victorian environment with they sheet fact that he does often and unabashedly challenge and fear down late 19 century niceties of what is appropriate. In that way Holmes is destroying the accepted gilded Victorian norms with forward thinking, being a prototype himself of the thinking and science it will take to navigate the 20th century. As Jeremy Brett is no Benedict Cumberbatch nor the reciprocal, neither are their Holmes’ comparable as they are both men of the times and both equally brilliant and enjoyable as expositors of those equally unique moments in time. You are placing your 21st Century sensabilities to Victorian fiction (Not to mention that you are completely ignoring the limitations of a non-visual medium). Is almost as if you hoped it be Harry Potter. Your point of Holmes and Watson being two dimentional characters is out right false. They don’t constantly call out each other on their characters description like House but most of it is there in their consistent character movements, attitudes and development. I’m not saying it’s particulary hard to understand but it doesn’t hold your hand. ACD’s style pretty much asked you to imagine the character’s body language and that’s how he explained his character, they are very psychologically realistic in many ways. You hoped for ACD to spent more of the book(s) establishing Holmes and Watson’s frindship. Victorian british people were never, EVER, that open about their emotion (that scene in a Game of Shadows were Holmes and Watson dance together was ridiculous in many many levels). But you still had it. Comments on Holmes secretly helping Watson sell his practice so that he could possibly move in with him again after Mary’s death. And your problem with the Final Problem, No, he didn’t told the secret war between Holmes and Moriarty and only showed us the finale, but that’s because Watson is our POV Character and he trusts Holmes like we do, and he has never seen him scared for his life like that, so that’s supposed to make the reader (who didn’t have the benefit of a 100 year old spoiler) to fear for Holmes’ life like Watson does and to believe that he is dead. Remember you probably went from FINA to EMPT immediately but other people had to wait 10 years for it to be published. Making it a Secret War was necessary, because if you have a villain with good publicity like Moriarty who no one but Holmes could believe was a criminal then Watson couldn’t write about him even if he did know the truth (like we later find out) because in the context of this stories and how they are framed it would constitute as libel. Holmes even says as much in Valley of Fear. AND it gives you the opportunity to reread this stories and look for places where Holmes was fighting Moriarty, hints that may be accidental but still fit perfectly like for example in the Red headed league (and Granada agreed, apparently). I want to keep answering but there is so much I disagreed (and some ponts are just factually wrong) with this article, I would end up dissecting every single parragraph. The reason why this source material has had such lasting popularity is because it is great. But you can’t read it expecting a 9 book story arc, it’s serialized fiction, love it for what it is. Jesus, I hope my point comes across even with the horrible Grammar. Okay, now you’re making me feel bad for spanking your horrible grammar before I saw you were horrified by your horrible grammar. Man, if you’re gonna troll me, couldn’t you do it without the second thoughts or post posting regrets no matter how minor? Because now I’m having regrets maybe and jeez, that’s complicated on a Saturday night when I still gotta do the dishes. On the other hand, your default mode was attack and I gotta tell you, I doubt you’re gonna get better, particularly since I really doubt your parents named you Vidocq. Anyone who doesn’t use a name that can be easily tied back to a person, those are the ones to watch out for. I’m happy to be proven wrong, by the by. I like ideas much better than arguments. More fun. Uh huh. First, it is perfectly valid to apply a modern sensibility to any work of fiction or literature. Unless a story continues to speak to audiences, it tends to not get read by anyone except specialists. And while I’m interested enough in how Victorians saw the works, and I’m perfectly happy to hear you like to read them in that way, I think that approach treats books like museum pieces, rather than living things about which we can have fresh conversations. Regarding Holmes, read the piece again. I called him fully formed and even neater trick, fully formed precisely because you cannot penetrate his surface. 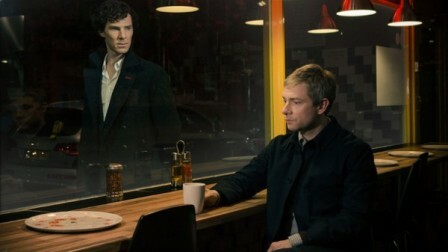 What is Holmes’ inner life? Who knows. I’m not sure Holmes knows, or maybe more precisely, cares. He is complete in his incompleteness. Sorry this was too complicated for you to understand. Though based on available evidence, I’m not surprised. I’ll be interested to hear the reasons for, or review examples of, why it is “out right false” to call Watson two dimensional cause, gotta tell you, don’t see it. I’ll also be perfectly happy to see the “ponts” (sic) that were factually wrong. I’ll also be happy to have you dissect a “parragraph” (sic again) in the process. You might be able to do it. But I smell something bullshitty in the claim. You spent a lot of time here — thanks for adding all the content, by the by, I take it as a compliment — so I would think that being the case, you would produce proofs if you have them. If you would like to simply claim these ideas as opinions, however, I’m content to accept them on that basis. Let’s see, what else. Ah, autism. I’m not going to give you the benefit of the doubt, since you haven’t earned the consideration, and say you apparently think that psychological phenomena don’t exist until they are defined; that human behaviors spring into being from the void only when labeled by science, rather than (say) science catching up with human behavior. I’m not actually sure Holmes is on the spectrum by the by. In some ways, he’s too joyful. The folks I know on the spectrum or say they are or someone has decided they are have an element of compulsion in their behavior. They are interested because they can’t help it. Holmes in the stories often just seems delighted. Maybe he’s obsessed because he has found his bliss? It’s a nice thought. What else? I suppose I should give you something; if you didn’t need to feel right you would not have commented as you did or more to the point, at all. Sorta pathetic don’t you think? Well, that’s off topic. Hmm. Ah. Here’s one. A truly intricate design is hard to distinguish from a mess. So maybe all the little pieces of Moriarity in the latter stories really is some deep game really smart people can put together. But to me, it looks like Doyle lost interest. Because when he was on his game, he created really tasty chess problems of mysteries AND then showed you how the games were played. And that was real fun. And that achievement is enduring. And deserves to be. But the Final Problem didn’t do that. Just said it was happening, but Doyle didn’t do the work. He did do nice character work in story, you did notice I said that right? Maybe not. What I particularly like is writers who can deliver great plot stories and great character stories at the same time. Anyhow, long response please! It’s a bear adding content all the time to this blog. Always keen to have eager fellas like you to help me out. Again with the “Sherlock Holmes seems to be suffering from an autism-spectrum disorder”! As Watson would say, “What ineffable twaddle!” Beside the fact autism was unknown in the Victorian Era and so Doyle could not create a character exhibiting those attributes, the fact is the Holmes of the Canon *does not* exhibit attributes of autism. While Holmes maybe said to fall into the long literary tradition of stereotypical British eccentric, Watson describes Holmes as “Bohemian”, that is someone who lives a non-traditional lifestyle and was usually associated with artistic types. That doesn’t mean Holmes had an atypical neurology. Holmes was no doubt a genius but we don’t need autism to explain his “intellectual powers”; “his deep knowledge of arcane subjects” is the result of years of study; “passionate focus on problems that interest him” make him a great detective as opposed to those members of Scotland Yard who were there to get a paycheck; “his inability to read social cues or manage social interactions” does not exist in Doyle’s stories–Holmes’ reading of social clues and interaction help him solve crimes time and again. Holmes was based on Doyle’s medical professor Joseph Bell who used careful observation to make Holmes-like deduction about patient’s professions, actions and symptoms and that such deductions were within the students power if they just applied themselves (“You know my methods. Apply them!” Holmes would frequently tell Watson). The trope of the “special” detective with amazing powers is a late 20th century construct cliched and hoary in a short time and seems to be insulting to neurotypicals and neuroatypicals alike. Like all human beings, Holmes was complex and often contradictory in both character and attitudes. While he frequently impressed those about him as unemotional (GREE, ILLU, SCAN, SIGN, SOLI, VALL) and introspective (BLUE), as scientific approaching to cold-bloodedness (STUD) or as an inhuman automation (SIGN) possessed of a “red-Indian composure” (CROO, NAVA) who “loved above all things precision and concentration of thought” (SOLI), Watson made constant reference to his restlessness (REDH, SIGN, THOR) and impatience (BRUC, EMPT, STUD, 3STU, VALL, YELL), his nervousness (ILLU, LADY, SIGN) and excitability (DANC, NORW, REIG, STOC, THOR), his eager nature (BERY, ENGR, HOUN, PRIO, SCAN), his habit of biting his nails when restless or preoccupied (BRUC, STOC), his concern with his own pride (FIVE) and self-respect (CHAS, HOUN), and a certain petty selfishness (NAVA). Tracy’s study of Holmes’ character goes for seven pages. I think a re-familiarization of the Canon is in order before you declare Moffat and Gatiss the winner. Hey thanks for this, it was very interesting and I appreciate long comments, which clearly take some time to write. Couple notes. First, I didn’t say Holmes had autism. I speculated that he might have an autism spectrum disorder, which could include a very mild form of Aspergers, for example. About this, I’m honestly not sure and the idea that he has an artistic temperament, as you suggest, seems more consistent with how much pleasure Holmes get in his work. Now there is no problem with assigning speculative psych diagnoses to characters which hadn’t been defined at the time of their creation, unless you wish to say the behavior didn’t exist before the DSM came along and put a name to it. Now you can’t say this was Doyle’s intention, but as you’ll note if you reread the post, I didn’t. Mmm, lots of hackles raised on the two dimensional phrase. No one seems to read the rest of the paragraphs, but perhaps I was not clear, or chose too loaded a phrase, so with your indulgence, I’ll try again. Recall that I said Holmes is fully formed and jumps right off the page and has lots of distinctive qualities, but one of them is that he is not particularly introspective and doesn’t seem all that interested in being so. Very human quality, but odd for a character in fiction where Hamlets predominant. So I’d say Holmes gets depth out of the fact it is absolutely persuasive that we don’t understand him. I certainly appreciate the long notes on this, because they were useful. I must say though that the reread the canon argument with which you conclude is very weak, compared to much of your other material. I have been reading the canon and I’ve been shocked by how poorly Doyle sometimes manages such strong material. I actually thought I had purchased a deeply corrupted e Edition when I read for example, the Final Problem. I liked the character interactions very well, but it seemed like … Well it seemed like Doyle couldn’t be bothered to make Holmes death a good story, or take advantage of the dramatic possibilities. I was actually a little offended, I thought “Come on you can do better than that.” That happened to me a lot. Moffat and Gatiss did bother to do better. You will note, or should, to whom I gave the credit for their success (well first two seasons, this third is kinda a stinker so far) and that was ACD. I understand that you didn’t say Holmes had autism but maybe somewhere on the spectrum. “What ineffable twaddle!” still covers it. Yes, Doyle could have written an autistic-spectrum character without knowing the symptoms, but the fact still remains Holmes doesn’t have those characteristics. A careful reading of the Canon shows this. Percy Phelps and his nurse looked at Holmes during this demonstration with surprise and a good deal of disappointment written upon their faces. He had fallen into a reverie, with the moss rose between his fingers. It had lasted some minutes before the young lady broke in upon it. (NAVA) Those are but two examples. As for Moriarty, Doyle indeed create him just to kill Holmes. Other have taken the idea of the archcriminal or archvillain that Doyle first created and used it to better advantage. But the ADHD, Joker-lite Jim Moriarty of “Sherlock” is no improvement over the original, despite the fine acting skills of Andrew Scott. On Scott, I expressed no opinion about whether he was a better Moriarty. I only said that the new show better exploited the potential of the character to create satisfying stories. Which you seem to agree with. On aspergers, repeating twaddle is not a rebuttal and seems a little less than your capabilities. Characteristics include an intense focus on narrow subjects, one side conversations (Holmes explains at length and Watson listens), for example. Other characteristics, not so much. Holmes shows some insensitivity to folks sometimes, not exactly gracious to the police all the time is he? On the other hand, he does seem to care about the people affected by the cases he takes. Does this rise to the level of aspergers clumsiness? Not sure. The point in any case is to look at Holmes at a new angle, and see what pops up, rather than nail him down. If trying out an idea and seeing how it works out is twaddle, then the world will be a much duller place. Again. Allow me to thank you for your time despite my argumentativeness on some points. An actual reply is a compliment, and when it is useful, and I think yours were, a service you’ve provided for free.